We’re happy to announce that we’ve released Encrypto. It’s an easy-to-use app (isn’t everything nowadays?) that lets you encrypt files with AES-256 encryption and then send them to friends or coworkers via built-in sharing options. 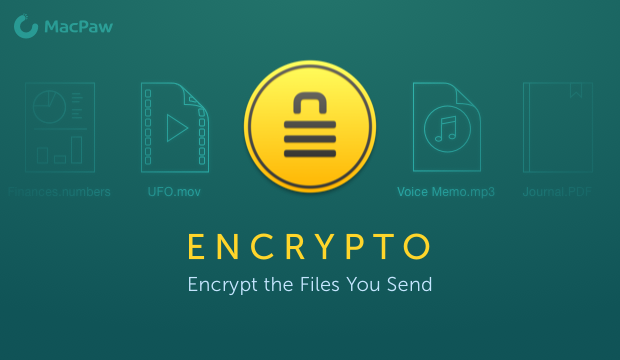 Just take your file or folder, drop it in Encrypto, encrypt it, and send it to anyone straight from within the app. It’s free to download and available on both Mac and Windows. The first reason is that our Hider 2 users asked for it. Many of them had requested a file-sending encryption app because they felt it was an important issue that needed solving and that it would help them in their day-to-day. And they’re right, which brings us to the second reason — we’re reaching a point where not encrypting files could be a problem. Putting your files on the internet, or even just sending them, without encrypting them is kinda the same as leaving your bike on the street without a bike lock. Once something reaches the internet, it’s possible for anyone to gain access to it. We figured it’s high time to make encryption available to everyone. So, many thanks to our Hider 2 users; without you Encrypto wouldn’t exist. Encrypto uses the Advanced Encryption Standard-256 bit key encryption, and it is, like its name, incredibly advanced and secure. It is the industry standard of encryption, and is the required level of security for top secret files by the American NSA and CSS. When your data is encrypted with AES-256, you know it’s safe. Encrypto brings encryption technology out of the “too-tech-to-touch” realm and into an app — File encryption is now as easy as drag and drop. What more is there to say? Its password protection uses smart hint features, so that your passwords are customizable. You create password for the encrypted file and then add a hint, so that the recipient of the file can decrypt the encrypted file. Encrypto’s password protection makes adding the right amount of security to files simple. Encrypto is compatible for both Mac and PC. Encrypted files can be sent from Mac to Mac through Native sharing features, or can be sent via other methods to PCs (and vice-versa). And that’s all there is to it! We hope you enjoy using Encrypto and please be sure to send us your feedback on the App Store, Twitter, and Facebook. Encrypto is free for Mac and for Windows.